A few years back there was an article about a device that recharges your mobile phone while your walking or hiking. A UT Arlington research associate and electrical engineering professor have designed a micro-windmill that generates wind energy and may become an innovative solution to cell phone batteries constantly in need of recharging and home energy generation where large windmills are not preferred. One of Rao’s micro-windmills is placed here on a penny. Smitha Rao and J.-C. Chiao designed and built the device that is about 1.8 mm at its widest point. A single grain of rice could hold about 10 of these tiny windmills. Hundreds of the windmills could be embedded in a sleeve for a cell phone. Wind, created by waving the cell phone in air or holding it up to an open window on a windy day, would generate the electricity that could be collected by the cell phone’s battery. 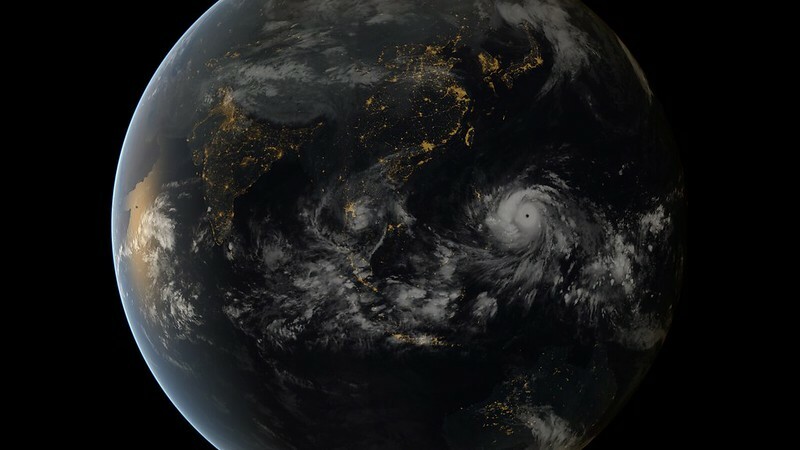 Super Typhoon Haiyan, known in the Philippines as Yolanda, appeared to retain much of its terrifying force as it moved west over the country, with sustained winds of 295 kph(183 mph), gusts as strong as 360 kph(223 mph). Haiyan’s wind strength makes it equivalent to a Category 5 hurricane. Haiyan had winds of 190 – 195 mph at landfall, making it the strongest tropical cyclone on record to make landfall in world history. The previous record was held by the Atlantic’s Hurricane Camille of 1969, which made landfall in Mississippi with 190 mph(305 kmh) winds. Haiyan hit Guiuan, on the Philippine island of Samar, at 4:40 am local time November 8, 2013 (20:40 UTC November 7.) Three hours before landfall, the Joint Typhoon Warning Center (JTWC) assessed Haiyan’s sustained winds at 195 mph, gusting to 235 mph, making it the 4th strongest tropical cyclone in world history.